Last week I attended the International Boys’ Schools Coalition (IBSC) conference in Richmond, Virginia in my capacity as coordinator of the IBSC Action Research Program. Every year a group of teachers from around the world are accepted into the research program and meet at the IBSC’s annual conference to share their ideas about an action research project they will undertake in their schools over the next 12 months. The research topic for the current 2013-2014 research team revolves around initiatives that foster character development in boys. Between now and the presentation of their projects at next year’s conference in Nashville, team members will continue to be supported as members of an online research community. As well as working with the current research team, the research topic for the 2014-2015 team was announced in Richmond, and this brings me to the subject of this post. It’s not an easy task to predict what research topic will be relevant and enticing to educators in twelve month’s time. That said, one can get a pretty good sense from the Twitterverse of learning initiatives that promise to be “hot” in the near future. And so it was that early this year I began to notice an increasing reference to the Maker Movement and Maker Learning. Since I wasn’t overly familiar with these concepts, I set out to find out more. The more I read, the more excited I became as the potential of Maker Learning to reshape teaching and learning in our schools became obvious. And so it was that I proposed Maker Learning be the IBSC action research topic for 2014-2015. The following Introduction to Maker Learning is what I wrote for the IBSC Trustees in the hope that they too would see the value of Maker Learning as a research topic. Despite compelling research indicating the value of constructionist learning and teaching, instructionist models of education that focus on standardised testing and assessment continue to prevail in our classrooms. Constructionist learning, or learning by “making,” is something children still largely engage in external to both the classroom and formal lessons: the playground is where a lot of the creativity, playing and making is happening. For many educators, the artificial separation in schools of making and learning sits uncomfortably with the need to facilitate in students those skills identified as important for effective learning in the twenty-first century: curiosity, intellectual courage, imagination, exploration, commitment, critical thinking, problem-solving, adaptability, resilience, and collaboration. These teachers should be encouraged, however, by the movement afoot to establish making in the classroom as a fundamental building block of twenty-first century learning; a movement which comes in the guise of the Maker Movement and its associated process of Maker Learning or Maker Education. The contemporary Maker Movement puts a label on something that humans have always done, and will always do: make things to solve problems that are personally meaningful. Most of us, if not all, were makers as children: think back to the cardboard box that became a garage, a puppet theatre or doll’s house; to the Lego blocks that became a starfighter or pirate ship. And many of us continue to make into adulthood as we dabble in all nature of hobbies and DIY projects. But what distinguishes the contemporary Maker Movement from previous notions of making (and many current examples of inquiry or project-based learning) is some 21st Century know-how in the form of a technology focus that extends and reshapes traditional making, and allows new forms of making to be pursued (Anderson, 2012). Amazing products, for example, are being made in the fields of 3D printing and fabrication (check out Thingiverse ), electronics, physical computing, wearable computing and E-textiles, LEGO engineering, electronic/digital music, and robotics. As well, technology has enabled what was once considered a fairly private pursuit to become a shared one as makers collaboratively design, create and share products online. With its strong links to educational theory, Maker Learning holds promise to be more than an educational one-night stand. In their recent book (and a must-read), Invent to learn: Making, tinkering and engineering in the classroom, Martinez and Stager (2013) highlight the connection between making and the constructivist learning theories of Dewey, Vygotsky, Montessori and Piaget, wherein a child’s learning is achieved through internal construction of meaning, not external instruction. In the 1970s, Seymour Papert, the “Godfather” of the Maker Movement, took the constructivist view of learning and extended it into a Theory of Constructionism. Central to this theory is the notion that learning is most effective when part of the learning experience involves construction of a meaningful product. In practical terms, making is learning that is personally meaningful, experiential and shareable (Martinez & Stager). The role of the teacher in this learning process, notes Papert, “is to create the conditions for invention rather than provide ready-made knowledge” (in Martinez & Stager, p. 57). that initial spark of curiosity, the investigation and early tinkering, the planning and research that follow, the inspirations and appropriations from other projects, the prototypes, the failures, the feedback, and, perhaps most importantly, the iterations upon iterations towards a better make. All of these acts are done in and contingent on well configured social contexts, in communities of practice and affinity spaces. Santo’s description ties in nicely with Sir Ken Robinson’s (2013) advocacy for a return to the nurturing of creativity in our classrooms, and also with Daniel Pink’s (2013) call for schools to allow students to engage in “uncommissioned works” where constraints of time, process and assessment are removed to provide autonomy for genuine learning. The potential value for all schools in adopting a Maker Learning model is obvious; it’s a model relevant to twenty-first century learning and teaching. The value of such a model for boys’ schools in particular is even more obvious, with the practical hands-on and technology focus of Maker Learner providing a natural fit with the learning styles of many boys ( Cox, 2011; Reichert & Hawley, 2010). *Note: The Trustees approved Maker learning as the topic for the IBSC Action Research Program in 2014-2015. Anderson, C. (2012). Makers: The new industrial revolution. Crown Business: New York. Chang, S. (n.d.). Ed and the Maker Movement: Old technology is new again. http://edtechhandbook.com/landscape/edu-maker-movement/. Martinez, S. & Stager, G. (2013). Invent to learn: making, tinkering and engineering in the classroom. Constructing Modern Knowledge Press: Torrence, CA. Pink, D. (2013). The importance of purpose. Edutech Conference. 3-4 June, 2013, Brisbane, Australia. Reichert, M. & Hawley, R. (2010). Reaching boys, Teaching boys: Strategies that work, and why. Jossey-Bass: San Francisco. Robinson, K. (2013). Creativity in schools. Edutech Conference. 3-4 June, 2013, Brisbane, Australia. Gershenfeld, G. (2005). FAB: The coming revolution on your desktop–from personal computers to personal fabrication. Basic Books: New York. Samtani, H. (2013). 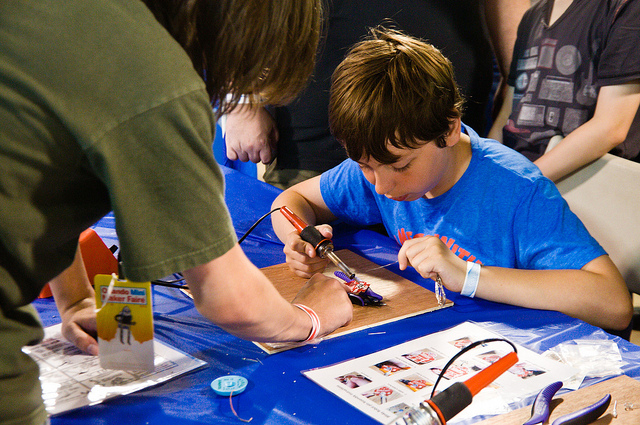 Meet the Makers: Can a DIY movement revolutionize how we learn? School Library Journal. Categories: 21c Learning | Tags: Constructionism, maker learning, Maker Movement, Martinez, Seymour Papert, Stager | Permalink. Teacher Librarian. Doctoral student, University of Sydney. Searching for substance, or is it CRAP? “I’m a m… on I’m a maker! Margot Long on I’m a maker! Knowledge is free at the library ~ just bring your own container. Anon. Life, the Universe and Everything I think about it.